Every morning I escape from the family routine of breakfast, showers, dishes, getting dressed, stop hitting your sister, and escape into my back room to sit. I used to get up before the kids and do this, but my son typically is wide awake at 6.30 ready to snuggle and be read to. Getting up at 5.30 would be wise, but just isn’t going to happen, if I’m being honest. Sitting in my bathrobe (sometimes I’m dressed first, not usually) I light the candles and the incense, waving it in front of Ganesh. Jai Ganesh. Then I wave it front of Kali. Jai Ma. This time of year I wave it over my ancestor altar and and hail the Mighty Dead and my Ancestors. I wave the incense around the entire altar and myself, bow and get to sitting meditation. Meditation lasts all of five to ten minutes. I miss the days where meditation alone lasted half an hour or more. I sit and breathe, trying to empty my brain and get centered in my body. Mostly I sit around wondering if I’ve taken the meat out to thaw for lunch, and what was I making for lunch again? Shoot, I never responded to that email from mother. When was the last time I called my sister? Oh crap, the baby bonked her head and needs Mama. Will she stop crying or do I need to attend? After I give up, I pull a tarot card. 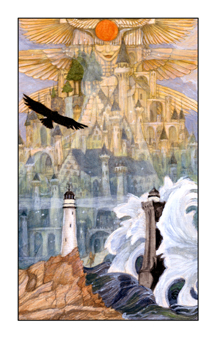 I’ve been working my way through Mary El’s beautiful tarot deck. I take each card as an inspiration and mediation for the day. Today’s was the 9 of Swords. According to her this is about pressure, the kind that clarifies and helps us return to our home state of glory. It’s an apt card for the day. Especially as I sit in a few in reflection for a few more minutes. Pressure. The kids are in the next room, laughing and playing and whacking each other. Our walls are very thin. It’s as if they are playing in my office. I sit in meditation with the pressures of family life all around me. Blog, clean, nurse, snuggle, listen, cook, walk, play, read, sit, reflect, love – there is time for it all in the day, but is there space enough? This is my daily pressure, my practice as a monk/householder. This entry was posted in Uncategorized and tagged family life, practice, tarot. Bookmark the permalink. Ah! You are a fan of the Mary-El too! Her book is hands down the best book on tarot I have read. He paintings are gorgeous and I am reading regularly again, all because of Marie White. I know what you mean about abbreviated practice. And I only have one kid! Adam and I have been following her work for YEARS! We are so excited to have her deck and even two pieces of her original art! I like her deck very much, but I have some critiques of the book. Maybe that would make a good post…. I can’t wait for Adam to finish his deck – his writing is the best writing on tarot I’ve ever read!